That photo can open closed doors and I pretend we’re best friends. To be exact; Just for 20 minutes. 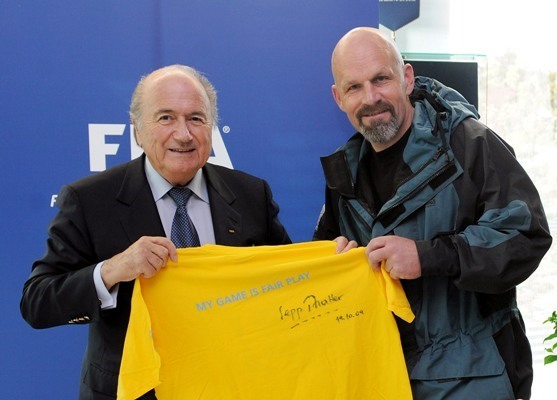 But I can say that Sepp and FIFA helped The Shirt and communications for humanitarian causes. I can say that he invited me in to the office when cycling in Swiss. I can say that he signed his shirt and donated to The Shirt. I can say that refugees in all the camps I visited in Africa was proud to see the photo. I can say that I guess he was behind the stringst to FIFA TV about when they made The Shirt content about refugees who was sent out to 700 million. 700 million. That is strong communication. Hope to see you on Danube. Hope you’ll donate a shirt. Sepp did! Bjorn with the photo (owner of photo; www.fifa.com ) and @heidenstrom on Twitter – and counting down to start paddling Danube and theBlack Sea.